This book reminded me of how necessary it is to go out of your comfort zone sometimes. This book reminded me that, no, I don’t normal read “war books,” but sometimes you need to take a risk and read something that is not your normal genre. This book reminded me that while it may not seem like I could relate to a Vietnam war vet, I would be wrong. 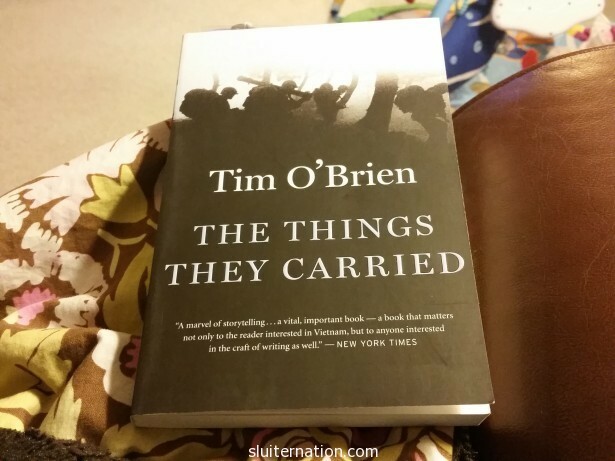 The Things They Carried by Tim O’Brien has been in my classroom library all year. I’ve wanted to recommend it–especially to boys who are finding a hard time choosing something–but I hadn’t read it and wasn’t sure how to present it. I don’t really read “war stories”. But I realized that by not reading it just for that reason, I was doing what my students were doing when they turned their noses up at books because the topic sounded boring. So when I raided my classroom library in May to bring home a stack to read, I included The Things They Carried. Naturally, it was the very last book I picked up out of all the books. And I’m sorry for that because I quite possibly connected most to this one. 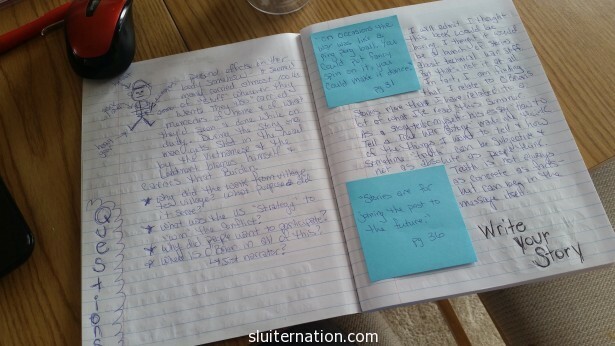 In fact, I used O’Brien’s book as the first in my Reader’s Notebook that I am creating as an example for my students. The Things They Carried is actually a collection of stories, many of which has been published elsewhere before being brought together as a collection. The book is labeled as fiction, although the narrator is O’Brien and he was in Vietnam and all the places and characters and circumstances are based on real life. I would say The Things They Carried is “True Fiction”. Everything he writes about is true, but it did not happen. Well, some of it may have happened, but not as he wrote it. Or to whom he wrote about. The truthiness of it plays with your mind a bit because it is so believable–graphic at times even–and yet, you know you are reading fiction. But while some of the details may be made up, it’s a True Vietnam War Story. Admittedly, I don’t know a lot about the Vietnam conflict, and this book didn’t answer many of those questions. And I’m glad. When people say that it’s important to read books to see what it was like for the people who lived it, they were talking about O’Brien’s writing. I’m sure of it. This book proves why it’s important to read beyond textbooks. A history book is not going to show the reader the effects of PTSD or how soldiers coped with all the death around them. It’s not going to show the horrors of silence. I think I connected to O’Brien’s words the most because he kept coming back to the idea of the story. How it’s important to tell your story. That even if you have to add details that did not happen, it’s Ok as long as they add to the truthfulness of the story. So your audience can feel and so you can release that bit of yourself from inside yourself.